Displaying a valuable antique that should be kept of the floor used to be a big and often costly project. You had to sew a pocket in the back of the rug, find a rod to insert into the pocket, find a way to attach the rod to the wall, etc. The project involved several skills that not everyone is good at. 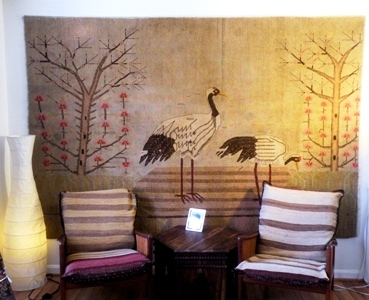 The alternative was to take the rug to an Oriental rug store and have it done professionally. The cost of the job, along with installation, was often in the hundreds of dollars. Well, that was all true before God invented Velcro, the magic sticky material which has replaced shoe laces in children’s shoes and has thousand other uses and applications, such as displaying an antique rug. To display a rug on a wall, staple one strip of Velcro to your wall at a desired place making sure the sticky stuff shows. You may also put in a few nails, evenly spaced if the rug is on the heavy side. Then staple the other half of the tape to the back of the rug along the top edge making sure the tape is not showing. Don't worry, the staples will not hurt the rug and the rug pile will hide them from view in the front. Here’s how. 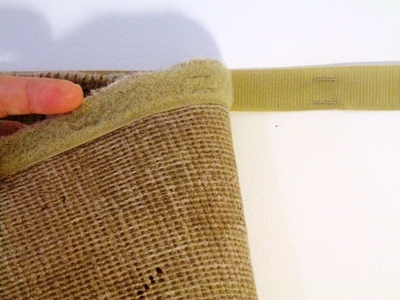 Buy a roll of inch wide Velcro tape the width of your rug. You can find them in drug stores, hobby shops or fabric stores. Measure your rug along the top side. Cut your Velcro just a little shorter than the width of the rug and separate the two sides of the tape (the fuzzy side from the plastic loop side, or whatever they call the two sides). Staple one side to your wall at a desired place making sure the sticky stuff shows. You may also put in a few nails, evenly spaced if the rug is on the heavy side. Now, staple the other half of the tape to the back of the rug along the top edge making sure the tape is not showing. Don’t worry, the staples will not hurt the rug and the rug pile will hide them from view in the front. The Velcro will allow even heavy rugs to be displayed on a wall. Finally, stick the Velcro on the rug to the Velcro on the wall and you are done. The display looks very professional, seamless and uncluttered. A Word of Caution: Very delicate textiles, such as Cashmere shawls, embroideries and fragile old kilims should not be stapled. You should simply hang them over a rod. There goes that rod again! Zoran Stamenic is a Worthologist who specializes in antique and collectible rugs and carpets. Vintage Clothing: To Buy or Not to Buy, That is the Question!